Puppies are such a wonderful life force! Almost nothing is as cute and full of life and energy as a new puppy! Personally, I love young puppies and old dogs. Young puppies are experiencing the world and life each exciting event at a time. And, old dogs are full of all of those experiences. I had a discussion with a new potential client just a couple of days ago. The client wanted to wait until her puppy was older before she began training. Back in the days of compulsion and training puppies with lots of corrections, she would probably have been right. 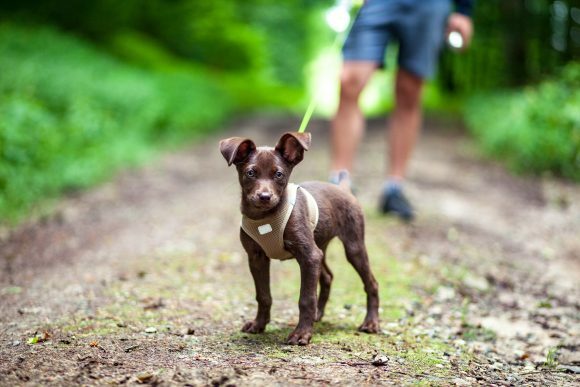 Lots of leash corrections and force can be bad for young puppies and can negatively affect their development. However, now that we utilize positive reinforcement there is no reason not to start training the moment you pick up your puppy! If you do it right, the puppy will learn all the good behavior you want him to show and you won’t even have to worry about compulsion or correction. First off let’s be honest. Each puppy, like each baby, gains control of their bladder at different times. But we can help facilitate his learning if we make it our duty (no pun intended) to ensure as few mistakes as possible. Proper puppy potty training is key! I tether my puppy to me during the day, so when he begins to pull and whine, I can get him outside. Having full access when they are very young is not beneficial to either of you. The last thing you want is for your puppy to learn to sneak off to do his business! Also, remember after naps, play, and eating or drinking your puppy is likely to need to go out and relieve himself. His bladder is small, and most puppies need to go outside about every 2 hours. If a puppy or a toddler want something, often they just take it. As we age, we realize that these behaviors aren’t acceptable, and we learn to control our impulses. Puppies also need to be taught impulse control. Nothing drives me crazier than seeing a two-year-old dog who steals food, toys and everything he wants. Good dogs and people control their impulses. Start by making your puppy sit and wait for you to put his food bowl down. If the puppy gets up, just raise the bowl. This is an ideal way to teach him that he has control over himself and his behaviors. And, as he learns, you can make the behavior more and more difficult, just be sure to also make it fun! One of my favorite things, when teaching my puppy class, is to pull a puppy and load the clicker as I reward and click good behavior. I love watching the puppy offer many behaviors to see if they will be rewarding. Not only are they learning what I like (sit, down, stay, watch), they are also learning what won’t work: barking, jumping and other bad behaviors. 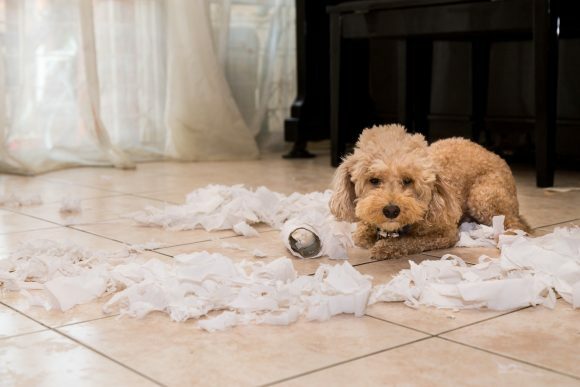 I don’t spend a lot of time yelling, chastising or correcting the puppy for these behaviors; I allow him to figure out that certain behaviors just aren’t worth showing because they will never be rewarding. Typically, I can teach a new puppy a few new behaviors during one of these sessions, and the puppy has truly “learned” to show these behaviors. They are learning they are in control of their training and environment and let’s face it, we all want to think that we have some control over our world. Just be smart and ensure that you are rewarding the correct behaviors! I’ve said it before, and I will say it again…puppies don’t spring from the womb knowing how to walk nicely on a leash. Being on a leash goes against everything that is natural for them. However, we want our puppies to be safe and being on a leash is part of life. All well mannered dogs should be trained to have leash skills. As I said earlier, I like to tether my puppies to me. This helps them to get used to the leash right away and, as mentioned, helps with potty training. Because I almost immediately tether my puppies, they never suffer from not wanting to walk on a leash or being leash phobic. I also don’t allow them to zoom around and act crazy on a leash. Of course, they need to be puppies and go outside and exercise; but by keeping them on a leash, I am teaching them to respect me and the leash. I also make sure that I teach them basic leash manners, so they never get into a habit of pulling. Anyone who knows me and knows my training, knows how much I love eye contact from my dogs. Teaching my dogs eye contact gives them a good behavior that I can control on cue. If I don’t want you to chase that squirrel, I may ask you to “watch me”. If I don’t want you pulling on leash, I may ask you to go in heel position and stare up at me while we walk. I watch my puppies in puppy class, stomping along next to their owners and occasionally looking up, lovingly. But 90% of my puppy owners don’t even notice this behavior, much less reward it. And, dog training 101 states that if you ignore a behavior, it will go away. If you don’t reward them for checking in and paying attention they will learn to do something else, like looking at everything else going on around them. I beg of you… reward your puppies for checking in and paying attention to you! And, if you want to be a step above; make sure you get it on command or cue. Stick to this list and you, too, will have a well trained and happy puppy! Would You Like To Know How To Program Your Puppy’s Personality? Our ‘Puppy Programming Course’ lets you look over our shoulder as we raise LIVE puppies, where you get to discover what exercises and games you should be playing with your dog during each new week of his life, so that they learn to handle fear, other dogs, new people, and control impulsive behaviors.